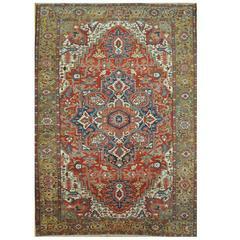 A large sized rug with Heriz Bakhshaish design. The pile is made of high end quality wool - hand spun, hand dyed with all vegetable dyes and knotted by master weavers. The rug is very decorative and almost square. The condition is exquisite. The rug was made in Afghanistan close to the Persian border. In the fourth quarter of the 20th century, there was a revival of traditional rug making by companies like woven legends and other firms that used Turkish and Afghan weaving skills to reproduce ancient and looked after Persian rugs. The design is geometric - this is typical for Heriz rugs. 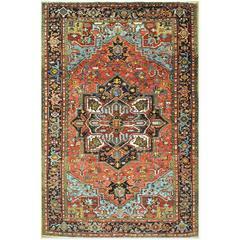 Colors and style are also seen on semi antique or vintage Persian Serapi, Bakhshaish, (also Bakhshaiesh) carpets. The rug is made of a woollen pile - warp and weft are also wool. This is a beautiful hand-knotted antique Persian Heriz rug with bright happy colors made with wool and all natural dyes. The rug measures 7'8'' x 12' and is in great condition.